In this article, I will go the basic principles of MVC, a run through the definition of the pattern and a quick example of MVC in PHP. This is definitely a read for anyone who has never coding with MVC before or those wanting to brush up on previous MVC development skills. The Model is the name given to the permanent storage of the data used in the overall design. It must allow access for the data to be viewed, or collected and written to, and is the bridge between the View component and the Controller component in the overall pattern. One important aspect of the Model is that it’s technically “blind” – by this I mean the model has no connection or knowledge of what happens to the data when it is passed to the View or Controller components. It neither calls nor seeks a response from the other parts; its sole purpose is to process data into its permanent storage or seek and prepare data to be passed along to the other parts. The Model, however, cannot simply be summed up as a database, or a gateway to another system which handles the data process. The Model must act as a gatekeeper to the data itself, asking no questions but accepting all requests which comes its way. 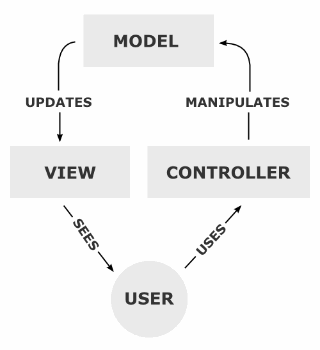 Often the most complex part of the MVC system, the Model component is also the pinnacle of the whole system since without it there isn’t a connection between the Controller and the View. The View is where data, requested from the Model, is viewed and its final output is determined. Traditionally in web apps built using MVC, the View is the part of the system where the HTML is generated and displayed. The View also ignites reactions from the user, who then goes on to interact with the Controller. The basic example of this is a button generated by a View, which a user clicks and triggers an action in the Controller. Furthermore, the description of Views as a template file is inaccurate. However, as Tom Butler points out, this is not one person’s fault but a multitude of errors by a multitude of developers which result in developers learning MVC incorrectly. They then go on to educate others incorrectly. The View is really much more than just a template, however modern MVC inspired frameworks have bastardised the view almost to the point that no one really cares whether or not a framework actually adheres to the correct MVC pattern or not. It’s also important to remember that the View part is never given data by the Controller. As I mentioned when discussing the Model, there is no direct relationship between the View and the Controller without the Model in between them. The final component of the triad is the Controller. Its job is to handle data that the user inputs or submits, and update the Model accordingly. The Controller’s life blood is the user; without user interactions, the Controller has no purpose. It is the only part of the pattern the user should be interacting with. The Controller can be summed up simply as a collector of information, which then passes it on to the Model to be organized for storage, and does not contain any logic other than that needed to collect the input. The Controller is also only connected to a single View and to a single Model, making it a one way data flow system, with handshakes and signoffs at each point of data exchange. It’s important to remember the Controller is only given tasks to perform when the user interacts with the View first, and that each Controller function is a trigger, set off by the user’s interaction with the View. The most common mistake made by developers is confusing the Controller for a gateway, and ultimately assigning it functions and responsibilities that the View should have (this is normally a result of the same developer confusing the View component simply as a template). Additionally, it’s a common mistake to give the Controller functions that give it the sole responsibility of crunching, passing, and processing data from the Model to the View, whereas in the MVC pattern this relationship should be kept between the Model and the View. As you can see in the example above, we don’t have any Controller-specific functionality because we don’t have any user interactions defined with our application. The View holds all of the functionality as the example is purely for display purposes. Run the code and when you click on the link you’ll be able to see the string change its data. We’ve covered the basic theory behind the MVC pattern and have produced a very basic MVC application, but we still have a long way to go before we get into any nitty-gritty functionality. Next up in the series we’ll cover some of the choices you face when trying to create a true MVC application on the web in PHP. Stay tuned! Comments on this article are closed. Have a question about MVC Patterns and PHP? Why not ask it on our forums?